2018 Baseball America's Minor League Baseball Manager of the Year Drew Saylor has been announced as the 2019 West Virginia Black Bears Manager. Saylor will be joined by Pitching Coach Tom Filer and Hitting Coach Jonny Tucker. Granville, WV-2018 Baseball America's Minor League Baseball Manager of the Year Drew Saylor has been announced as the 2019 West Virginia Black Bears Manager. Saylor will be joined by Pitching Coach Tom Filer and Hitting Coach Jonny Tucker. Saylor will be the 4th Manager in WV Black Bears history. 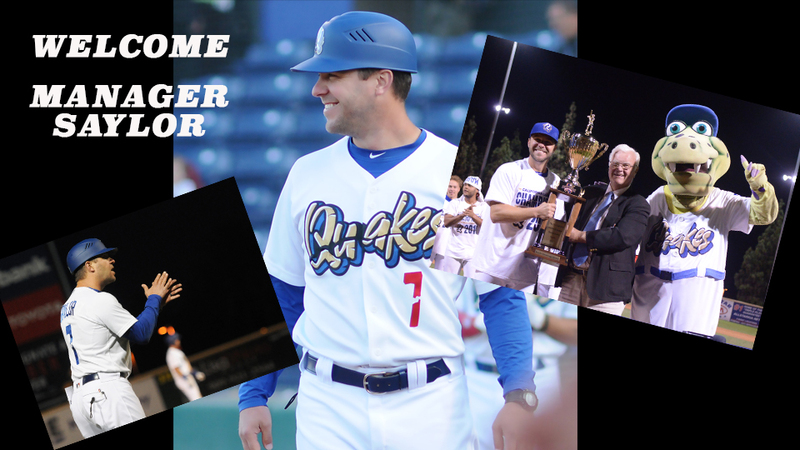 In 2018 he led the Rancho Cucamonga Quakes to a 87-53 season which culminated in capturing the California League Championship. His time in the LA Dodgers player development system went from 2015-2018, managing their High-A team. Before joining the Dodgers, he spent time coaching within the Colorado Rockies player development system. A graduate of Kent State University, Saylor was drafted in the 13th round of the 2006 draft by the Florida Marlins. He spent 5 seasons playing in minor league baseball before making the transition over to a coach. When asked about his transition from the California League to the New York-Penn League he stated, "Getting the chance to come back closer to home and be a part of two first class organizations like the Black Bears and Pirates is very exciting! From the stadium, to the front office and Morgantown Community, my family and I are looking forward to a great summer ahead." General Manager Matthew Drayer stated, "We look forward to welcoming the award-winning Drew Saylor to Monongalia County Ballpark. His credentials combined with the passion he has for coaching baseball will be a great fit for our organization. We are looking forward to working with him, Coach Filer and Coach Tucker to build a great atmosphere for our fan base for the 2019 season." Pitching Coach Tom Filer will be joining the Black Bears for a fourth season. He began his coaching career within the New York Yankees system in 1994. Entering his 25th season coaching, this will be Filer's 10th season with the Pirates Organization. Coach Filer has worked with former Black Bear and now Pittsburgh Pirate RHP Edgar Santana as well as many others including LHP Brandon Waddell and RHP JT Brubaker. Waddell will join the Pirates in Major League Spring Training camp in February. Brubaker was recently added to the Pirates 40-man roster. Hitting Coach Jonny Tucker will be a new addition to the staff this upcoming season. Tucker spent 8 years in Minor League Baseball. He began his professional career after being drafted as a center fielder in 2004 by the Baltimore Orioles. Season tickets for the 2019 season are on sale now by calling 204-293-7653. For more information on the WV Black Bears visit WestVirginiaBlackBears.com.